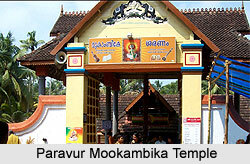 Dakshina Mookambika Saraswathy Temple is located in North Paruvur in Ernakulam District, Kerala. It is one of the famous Saraswathy Temple in Kerala. The Navratri music festival and the Vidyarambam ceremony are the main famous festival in Dakshina Mookambika Temple. The Navarathri music festival starts from the Uttrattati asterism in the month of Kanni(September-October). Nine days of dance and music makes the navarathri fest a glorious celebration. Mostly small children’s ‘Arangettams’ – the dance and music performance are the main program in navarathri fest. On Durgashtami, books are arranged in front of the image of Goddess Saraswati. On Vijayadasami day, ‘Ezhuthinirithu’ or ‘Vidyarambham’ ceremony takes place at a special mandapam in Temple, which begins from ( after the Saraswathy pooja ) 4:00 am and lasts till 11 am. On this day thousands of little children are initiated into the world of letters and knowledge by writing the mantra ‘Harishree’ on rice. Dakshina Mookambika Temple Paravur Navarathri festival 2018 starts on October 9 and ends on October 19th, 2018 in Vijayadashmi Day. Paravur Dakshina Mookambika Temple Vidyarambham ceremony starts from 4 am and lasts till 11 am on October 19, Friday, 2018. Vidhyarambham 2018 Date and Timing: October 19, Friday, 2018, 4: 00 AM to 11:00 AM.